SGX: Raffles United (K22) RAFFLES UNITED HOLDINGS LTD.
Raffles United Holdings Ltd, an investment holding company, operates as a stockist, distributor, and retailer of bearings and seals for the automotive part dealers, industrial suppliers, hardware dealers, ship chandlers, general trading companies, and original equipment manufacturers in the Southeast Asia and the Far East. It operates through Bearings and Seals, and Property divisions. The company’s bearings and seals products are used in transportation, electronics, construction, oil and gas, and others industries. It is also involved in the property investment and property development activities. The company was formerly known as Kian Ho Bearings Ltd and changed its name to Raffles United Holdings Ltd in December 2014. 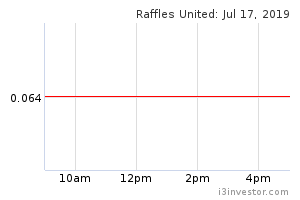 Raffles United Holdings Ltd was founded in 1956 and is headquartered in Singapore. Raffles United Holdings Ltd is a subsidiary of Raffles United Pte Ltd.